Welcome back Katie, our contributing wedding writer who is getting married this Pi Day! When you go accessory shopping for your bridal trousseau, make sure to bring a nice brown paper lunch bag. Not because you filled it with snacks, which you may also need, but to stop the onslaught of hyperventilating from sticker shock. Shoes, jewels, and veils are a notoriously high wedding cost, but there are some easy ways to incorporate more meaning and spend less on the pieces that tie your look together. If you’re a shoe girl like me, you will have to will yourself away from every new pair of shoes that could be perfect for your big day. While I love the idea of perfectly pristine white pumps with cute glitter accents, I can’t see myself wearing the shoes a second time. I decided to take a spin through my shoe collection. Warning: sometimes this can cause an adverse effect and reaffirm that you need shoes. Proceed carefully. Several years ago, I purchased a pair of Kate Spade navy polka dot strappy heels with a bow! on clearance for about $60. I’ve already broken them in and worn them to a ton of different events. The multiple wears does mean that my wedding kicks might have some stains or imperfect soles, but the shoes are perfect for the theme of polka dots with navy and coral tones. Even better: they are the right height for my dress—no hemming required! Every bride needs to sparkle, but we’re not all made of gold bars. I’m still deciding on earrings, bracelets, and necklaces for the big day, but I’ve got some great options including pieces that I’ve worn in previous weddings as a bridesmaid, as well as a set that my future mother-in-law gifted this Christmas. I’d really like to use those beads as they belonged to my fiance’s grandmother, but they need some TLC due to aging and use. If I can get the parts I need to do some fixes, the family memories can’t be beat—even if it means adding them to the bouquet or rethinking a necklace into a bracelet. DIY Style or borrowed family heirloom veils can add some bling without cha-ching. As a DIY-er, I could not even believe that a plain veil that was finger tip length was $100 at a national retailer. While the tulle may have been a higher grade than the craft-store-next-door stuff, it certainly did not have $100 finishes. I took a stab at creating my own bird cage combining tips from several different YouTube tutorials and in total, it cost less than $8 including the tulle, thread, and package of combs. A little tip: buy enough material to make two so you can play around with shapes and lengths. Veils are another great place to ask around your friends and family as many women still have their veil and have no big plans for it. My future sister-in-law who married last July offered me her gorgeous veil, and another of her friends will be using it after me—sisterhood of the traveling veil! After spending a bit too much time looking a bridal party photos on Pinterest, I’ll be using both veils at different points, but I won’t feel bad about having spent too much! Is a Sou-Sou for You? This entry was posted in Ways to Save Money, Wedding on a Budget on January 30, 2015 by Katie Jakub. I’ve been married for over six years now, but I still live to think about weddings! We all know wedding dresses seem so overpriced. But until you go look for a veil, you have no idea that they are worse!! I was delighted to wear my mother’s. After a quick conversion from a padded headband (thanks 1980) to a comb, we were good to go. Like you I recycled shoes too. I wore boots for the reception – hello comfort, and fit my hubby and our setting to perfection. But my ceremony shoes were ones I’d worn before, and worn since. Great advice! Perhaps I’m partial though since I did the same things. Sounds like you did it smart! My jewelry was a necklace that every bride in his family wears on their wedding day, so that was a nice little built in! And the price of a piece of tulle you wear on your head is ridiculous to say the least. Great minds think alike! I hope 6 years down the road that I can even remember what all the different small bits are. It seems like such a cost to buy all new when in reality, I’ll switch to flats after the ceremony and probably end up in bare feet by the end. Love these tips! I bought new shoes that were comfy and I’ve been able to wear several times since. I went with a string of pearls that I had got as a gift for my jewellery. And I borrowed a veil from a friend. I like to know that my something borrowed came from a couple with such a strong marriage. I was so dumb with the shoes. They were not comfy and I probably won’t wear them again… I couldn’t feel my toes until a few days into our honeymoon! My shoes aren’t spectacularly comfortable, but since they fit the theme and were already in my closet, I’m willing to suffer a smidge. I’ll probably be like Femme and trying to coax feeling back into my feet on our honeymoon! I absolutely love using items from couples with a strong marriage! It feels like such good karma! For my wedding (I’m whispering the wedding I wish didn’t happen) I saved so much money by embracing DIY projects. Just looking at most of the wedding stuff they were mostly made by someone, so I decided why not I make it myself…..for cheap. Nothing wrong with borrowing. Depending on what it is it could make your day very special. I wish there was a way to boost the confidence of people who don’t like the DIY route because they don’t think they’re crafty–they are so many simple projects to add to your day and not the price tag! I love all the diy ideas -as mother of the bride as I complimented for my outfit many time. The outfit was a thrift store find but the shoes were another matter, they were brand spanking new. I just couldn’t find what i thought I needed in my closet. Oh man and they were 1/2 size too small. My feet swelled up so much that I took them off and never to get them back on. Luckily Mom lived just down the block and I was able to go to her house to borrow slippers. Thrift stores and antique malls are my happy shopping places to get the unique pieces that just can’t be beat! My best friend owns an Antique Mall not far from me and has some of the absolutely most adorable stuff. Shoes are always tricky. You never know what’s going to happen. 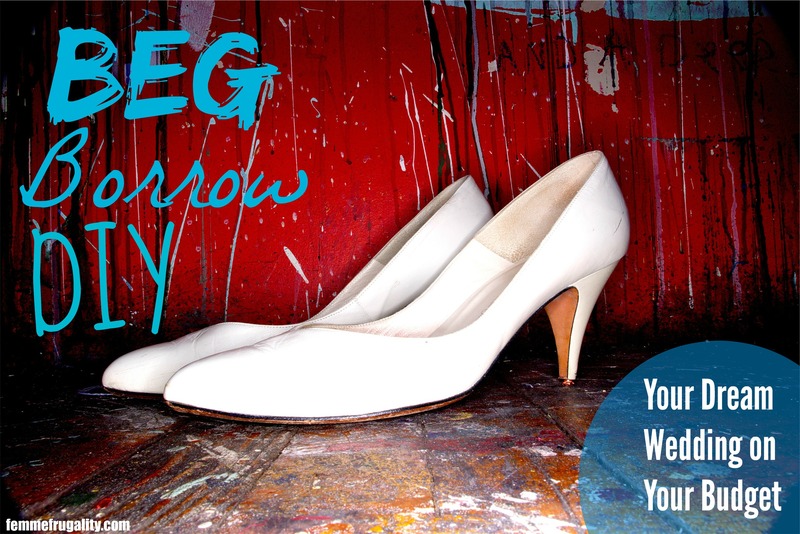 I’m generally a flat wearer day to day–heels do a number on your feet! I am really impressed that you made your own veil!! I know there is no way that I would be able to do that, but I wish I would’ve read this sooner because I would have asked my friends about borrowing!! Thank you! I’ve been doing crafts and sewing since I was 6 so it almost feels innate. I’m lucky that a lot of people in my life have been getting married recently so they’re offering all their goods up versus me even having to ask! I love that you just repurposed your own shoes! New shoes can be so ridiculously painful to break in, who wants to deal with that on a day like your wedding??? Haha. The shoes still aren’t comfy, but fashion over function! My friend is getting married and she is basically making everything. She is pretty talented though. I would be too afraid. I’m the same way! Zero craftiness. Katie’s rocking it, though. Hmmm…I don’t think i have my mini veil. I didn’t use a traditional one. I rarely wear makeup and so the one day when I was all dolled up – didn’t want to hide it under anything. I guess I had a vanity moment. But my mother was all – why can’t you just be normal – so she had the seamstress add a veil piece on the back of my head piece. It was cute & different, didn’t cover my face, so I was cool. Congrats on your upcoming nuptials!! !